Location: Near Skei in Jølster, Norway. 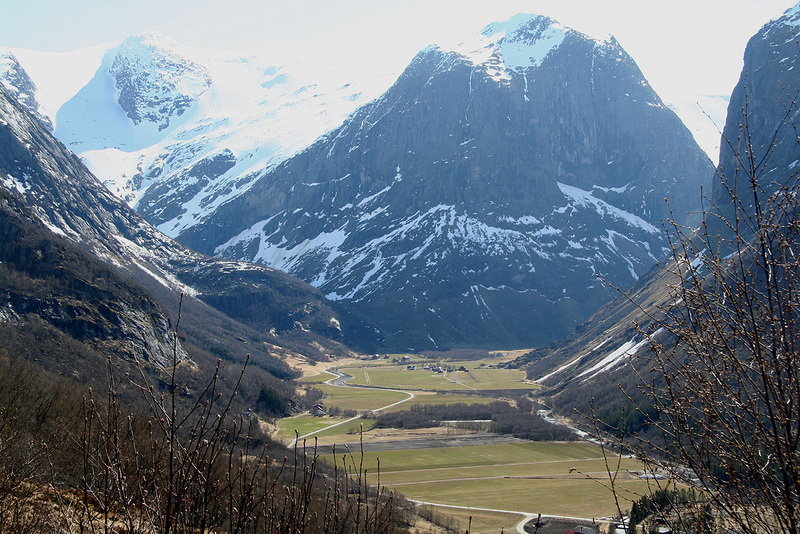 How to get there: This mountain is located near (north of) the small village Skei in Jølster. From Bergen, drive north along Hwy. E-39 to Sognefjorden, cross (by ferry) to Lavik and continue via Førde to Skei at the northern end of the big lake Jølstravatnet. The distance is about 220 kilometer and should take a bit less than 4 hours. Measure from the main road intersection in Skei and continue north on E-39 another 5.4 km. Locate the (signed) side road going right to Stardalen. This place is called Klakegg and the sign may say Fonn. Take this road, first along the south side of the river, later on the north side another 10.6 km (to kilometer 16). Here, along a very straight section of the road, turn left following a sign saying "Høyseth 0.5 km". Drive approximately 700 meter and locate a private (toll) road that forks left and obviously ascends the steep hill. Pay toll (NOK 50 in 2009) at the self serve station, then drive the small, but good dirt road uphill as it climbs with sharp curves. This road is closed in winter. In the spring it may be driven perhaps to the top of the first (main) hill. In summer, one can drive to the summer farm area called Haugastøylen. We parked on the side of the road at location N61:37.425, E006:42.876, elevation about 520 meter, as snow blocked the road preventing further driving. 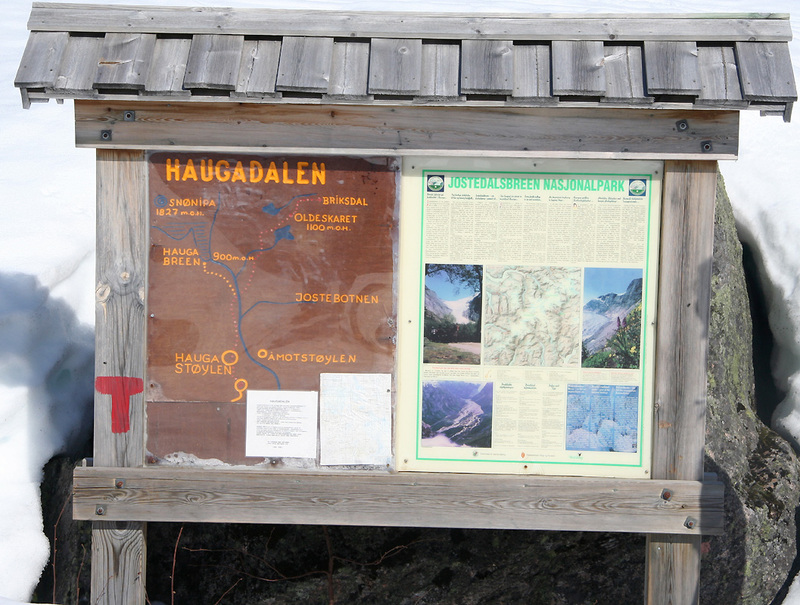 Route description: The first part of this route proceeds from Høyseth up and into Haugadalen to the farm summer area called Haugastøylen, see above. One should be aware that Haugadalen is hit by snow avalanches from the slopes on the west (left side) that may overrun the road. There are also avalanches (somewhat more local) coming down from the east slopes. Thus, travel along the road may be UNSAFE until AFTER these avalanches have occured in the spring. A local person informed us that the avalanches rarely go much beyond the river, thus a safer route earlier in the season may be to ski up the middle of the valley perhaps 50 meter east of the river Driva, then connect with the road as it again climbs (the second) uphill. From Haugastøylen, you see three valleys branching further along. The middle valley leads to the pass Oldeskardet, a route across to Briksdalen. 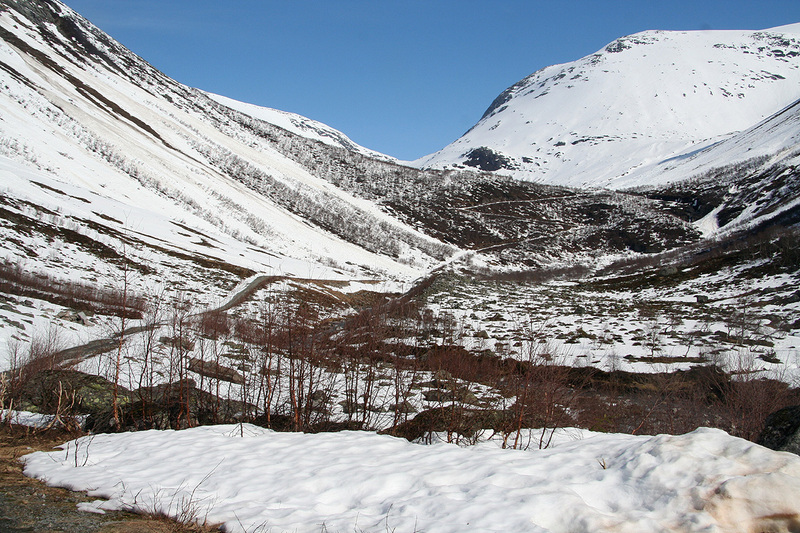 The correct route is the leftmost valley essentially filled by the glacier Haugabreen. 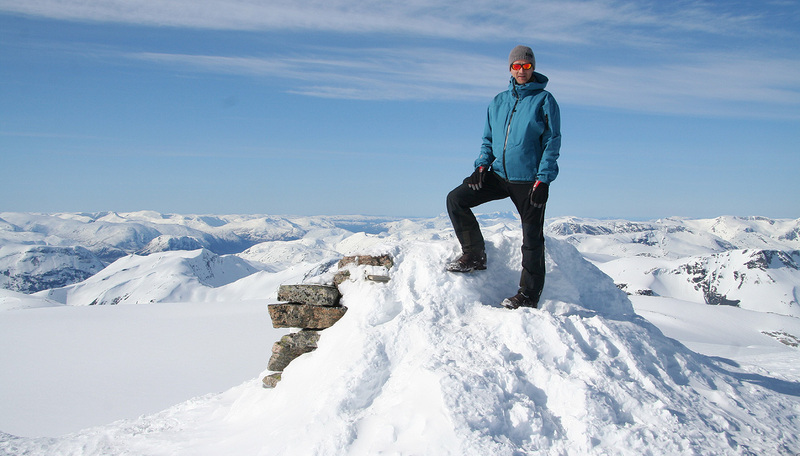 In summer, one may climb the slopes west of Haugabreen as the crevasses can be cumbersome. 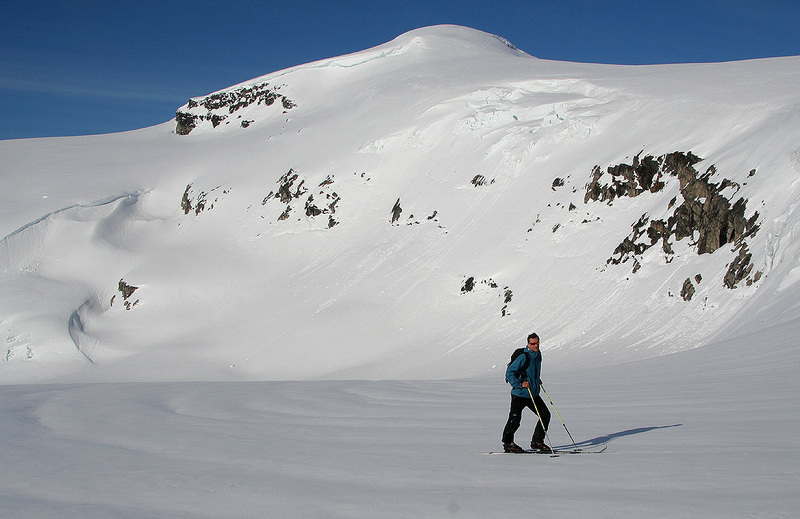 In spring, the route straight up the glacier is perhaps the most popular ski route to Snønipa. 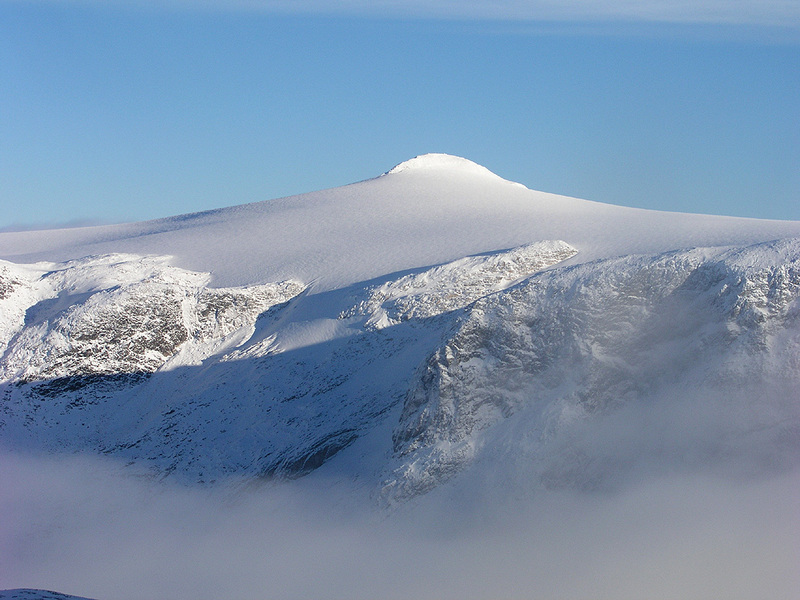 The normal route thus proceeds north while climbing Haugabreen to about 1500 meter, then curving west (left) and south-west in order to climb the Snønipa summit. The final slope is again slightly steeper, but poses no problems for a ski ascent. 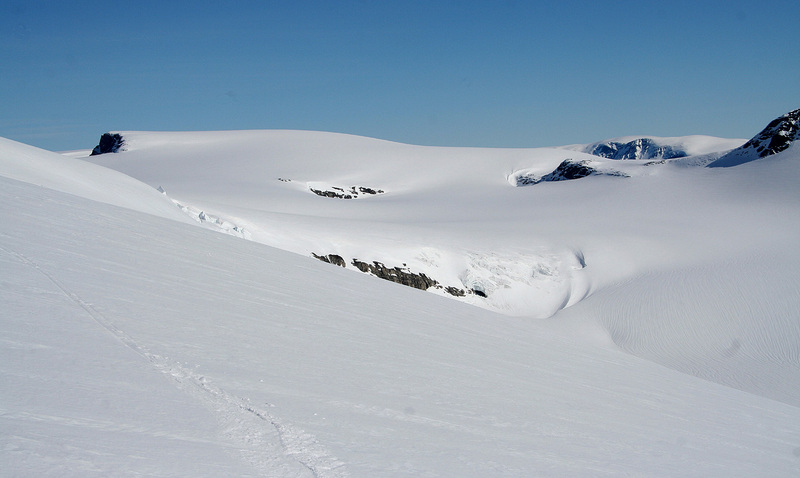 An alternative, perhaps more popular when descending, is to leave Haugabreen at about 1250 meter and climb the slope (going west) for about 300 vertical meter to arrive on the plateau just south of the Snønipa summit. Comments: I did this trip with my friend Olav Glosli. We left Bergen after work on Friday and drove to the trailhead where we slept in the luxurious accommodations provided by Olav's car. Saturday morning, we left at 0655 after having a nice breakfast. The snow was pretty hard and skiing was easy as we passed the summer (farm) cabins at Haugastøylen. From here, the route traversed along the slopes on our (west) left hand side in order to gain access to the lower end of the glacier. 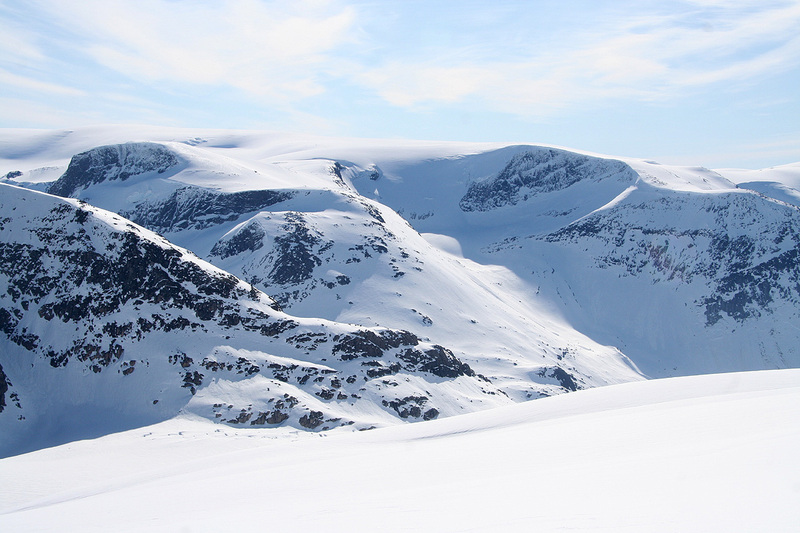 It was a gorgeous morning, blue sky and early sunshine, just a "prototype day" for what spring skiing in Norway is all about. We made rapid progress up the Haugabreen glacier and I noticed that violet klister ski wax would have rendered better skiing than "pushing" skis with skins. This, however, was a rather minor observation relative to the perfect conditions and the marvelous mountain landscape that unfolded as we ascended. 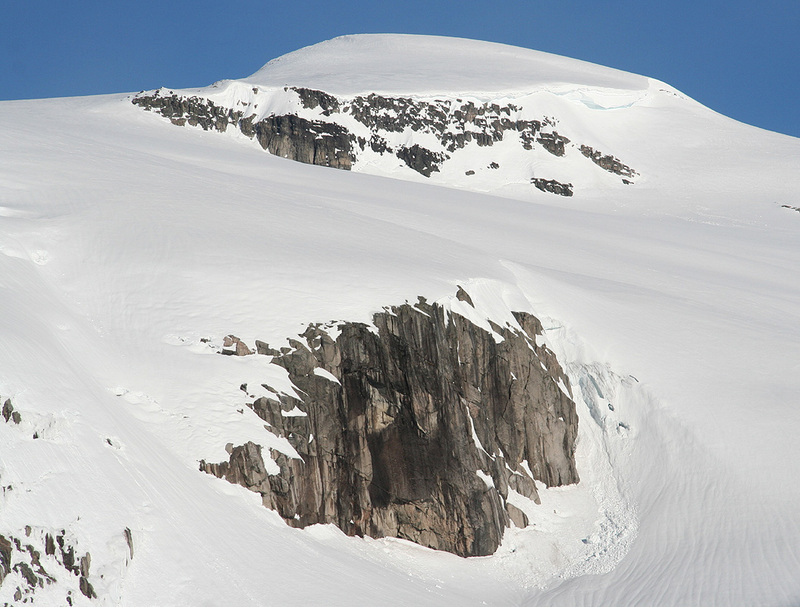 First, the broken terrain revealing ice and crevasses lower down, then a more smooth glacier with clear views up to the sunny summit high above on our left side. 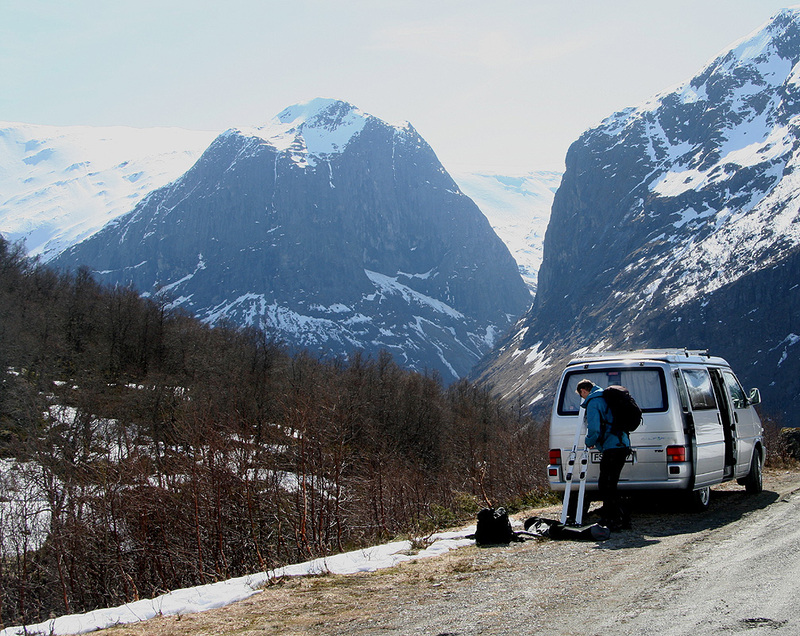 Looking back, the smooth and rolling curves of the gigantic Jostedal glacier became more and more dominant across the valley. We reached the summit by 1015, having taken a break for chocolate (Kvikk Lunch) and water before hitting the final, slightly steeper slope. The view from this summit was just as nice as expected. To the north, there were still some clouds with scattered peaks. 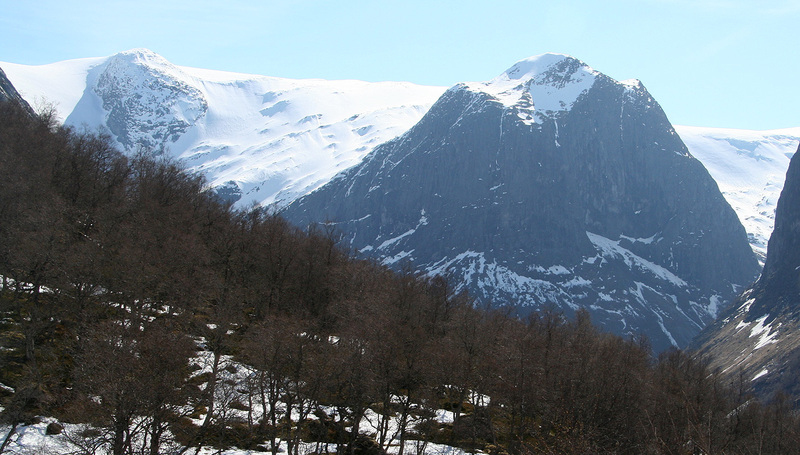 The entire east view is the Jostedalen glacier with the shapely Lodalskåpa in the north. Hurrungane (the taller peaks) are visible across the glacier. Further south is Grovabreen, while Kvamshesten and Blægja stand guard to the southwest. Right across is Storfonn and further out the majestetic Gjegnen. Such a scenery, broken by the deep valleys and fjords is truely a trademark for Norway's west coast. We left closer to 1100 and skied south from the summit, then directly east (left) and back down to the glacier in the valley. 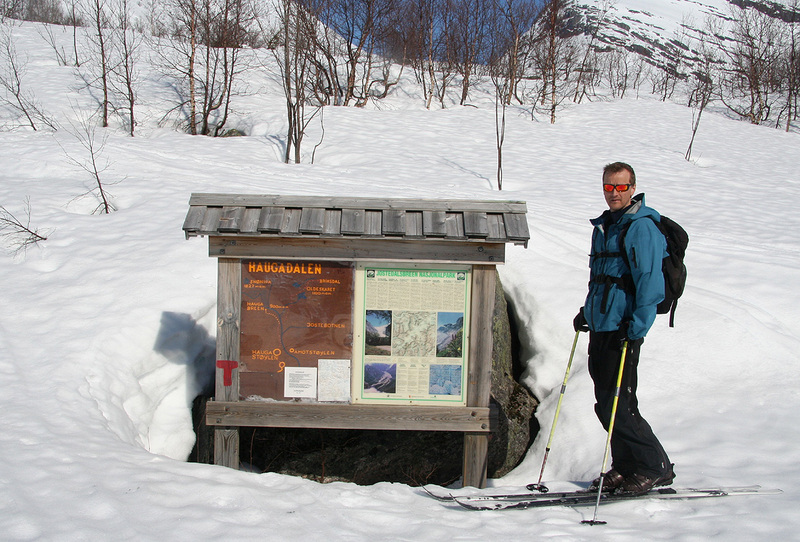 The snow was pretty good and Olav took the opportunity to get to know his new "Nansen" Telemark skis. After a couple of smaller "incidents" man and ski seemed to agree and left a track with numerous nice curves down the hillside. The snow kept well and we only broke through a couple of times at the lower section before returning to Haugastøylen, then reaching the car by 1210. We were back in Bergen shortly before 1700. Many thanks to Olav for providing good company, a luxurious (camping) car and, in particular, for responding to my suggestion of climbing Snønipa on such short notice. Snønipa as seen from Storfonn. The summit, Olav enjoys the scenery. View northwest to north, towards Møre. View east, Hurrungane, Skagastøls and Austabotntinder. View south, still winter in the mountains. Myklebustbreen, landscape as seen while descending. View from our trailhead. Stardalen and Jostedalsbreen. Stardalen as seen when descending the toll road. Notice how completely flat the valley floor is.